Ask Granny | Narre Warren & District Family History Group Inc.
Home » Posts Tagged "Ask Granny"
The “Ask Granny” program was developed in Athens and Clarke County, Georgia, USA by Greg Crane and Judy Russell. The program’s focus is to encourage senior citizens to write down their family history and memories before it is too late. Greg and Judy have developed specially formatted materials that feature large print and are easy to use. The “Ask Granny” workshops are limited to a maximum of 12 participants to ensure that everyone gets an opportunity to participate fully and the experience is an enjoyable one. The Narre Warren & District Family History Group are proud to be associated with the “Ask Granny” program. 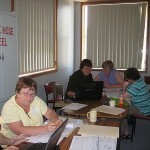 We presented our first “Ask Granny” workshop to the Pakenham Arthritis Group in February 2010. A couple of the participants said that they’d been prompted recently by family members to document what they know of their family history and their life but didn’t know where to start and we were very happy to be given the opportunity to help with this.